To find more, try a search on "site:pe.usps.com dmm notice 123 Price List [desired date]"
Note the use of a command -- respected by most search company servers -- to look only at a particular group of sites (site:[URL], a so-called "site search"). The site specification need only include the site, not the https:// protocol specification associated with a valid URL address. 27 January 2013 rate increases more than doubled some prices. 26 Jan2014 - no change (copy of Jan2014 rates posted to Web Feb2014). . This ends the Intl. Small Pkg rate data as of 31May2015. 17Jan2016 - First-Class Package International Service changed greatly. Zoning: 9 different zones instead of the simpler system of Canada-Mexico+2Groups-of-Zones. Weight Binning: Only 4 different weight/rates were offered: 1-8oz, 2,3, & 4 pounds. To Kenya, Zone 7, 52 oz at $36.40 increased to $57.25, the 4 lb price. 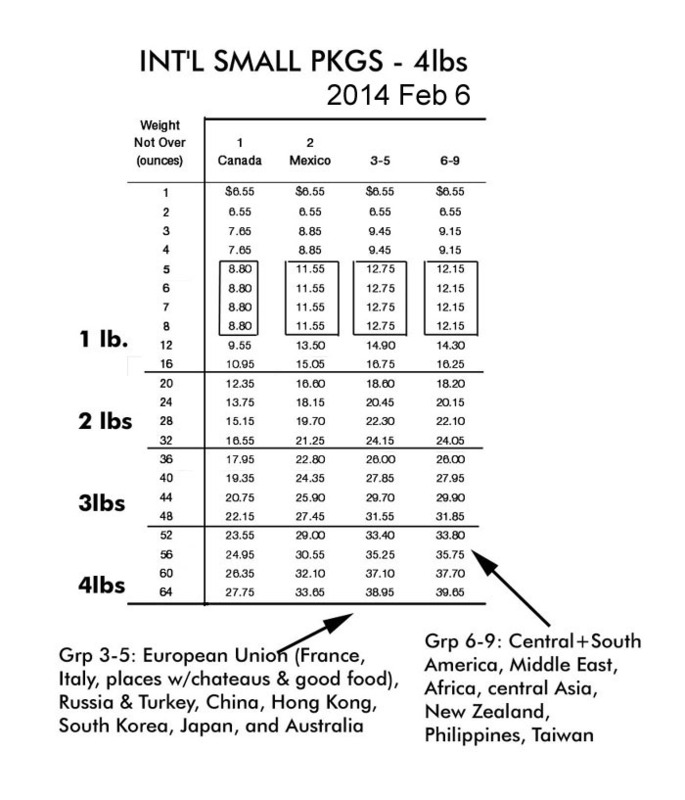 Rates went up, for example, for 4 lbs, $29.15->36.50 for Canada, $35.95->45.75 for Mexico, France $41.35->$49.50 (Zone5), Kenya $42.70->$57.25 (Zone 7). E-COMMERCE AND GLOBALIZATION OF THE PLANET DRIVE INTERNATIONAL PACKAGE TRAFFIC. During the ten years from 2006-2015 inclusive, when international package shipping costs are climbing steeply, package volumes (domestic and international volumes, including the First-Class Package International Service reviewed here, plus Priority boxes and envelopes) increased 36% while first class revenues decreased 36%. (I do not know if First Class Packages were counted in both statistics.) International volumes/revenues are not broken out, so comparing competitive success against UPS vs DHL is impossible. We can only be sure that, just as email, messaging, Whatsap kill first class letter volumes, so Internet commerce will carry package delivery to new heights. Most recent changes to international package delivery may be viewed as a combination of underpricing the service for large corporations (eBay) and large exporters (China), while making the service unnecessary complex, unavailable on-line, and too expensive for non-corporate customers known as US citizens. On 10April2016, the Postal regulatory Commission ended the 2-year "exigent surcharge" of 2014, and prices were widely rolled back, but often to values never seen before. First Class International Small Package Service rates did change. Since 17 January 2016, first-class international small package rates vary in 9 zones; zones 3-5 are no longer identical, and zones 6-9 are not identical. Since no trend may be discerned across zones, there is no reason to have them. Up to and including 3 lbs, all zones except #8 could be combined into a single zone with no rate variation greater than $2. A slight scatter of less than two dollars does not justify the zones that cause it. Far more money is lost by failure to obtain compensation from China Post for eBay traffic than by zoning errors. The "capture" of the Inspector General offices by most of the Cabinet-level Departments that they are supposed to hold to account (the USPS also has an Inspector General) raises fears for the independence of the Office of Chief Postal Inspector at the USPS. We may never get a solid audit of how many hundreds of millions of dollars a year the USPS loses each year carrying 100 million items from China to the USA for free for eBay. eBay collects the sellers' fees, but we do not collect adequate postage. did not increase, nor did Africa & islands like the Seychelles in Indian Ocean off Africa. 2019 increases were only for heavier parcels to Middle East sheikdoms, Algeria. service removed from Congressional, democratic, popular supervision.